This is one of our favorite dishes to make. 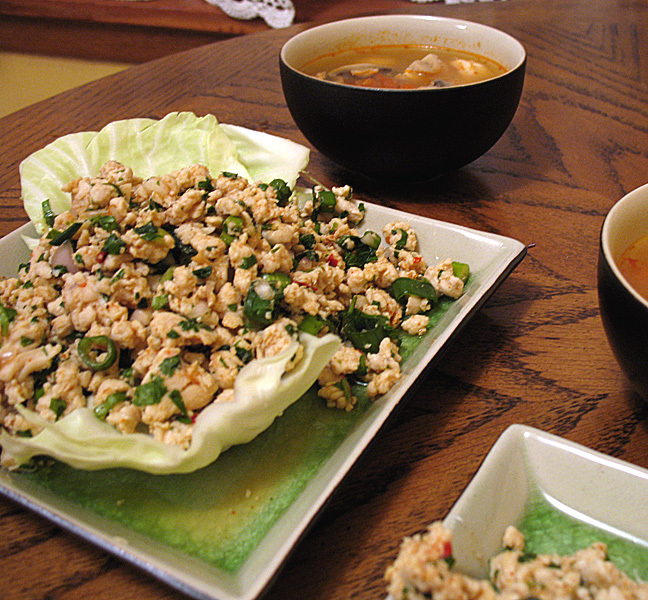 Larb Gai is a Thai dish consisting of ground chicken mixed with rice powder, cilantro, shallots, green onions, the ever-popular fish sauce and lime juice. It’s served with cabbage leaves for scooping or wrapping. You can also make it with ground pork (Larb Moo) or beef (Larb Neua). Tom Yum Goong is the classic hot and sour Thai soup with shrimp and mushrooms. Our favorite Larb Gai recipe comes from RecipeZaar and is incredibly healthy (no oil) and just delicious. I’ve been experimenting with the Tom Yum recipe, but my starting point was this one, also from RecipeZaar. I thought there was way too much lime juice in the original recipe. The kaffir lime leaves seem to be a key ingredient. We once made it with lime zest and it just wasn’t the same. This entry was posted on Wednesday, March 28th, 2007 at 7:15 pm	and is filed under Main Dishes, Thai. You can follow any responses to this entry through the RSS 2.0 feed. You can leave a response, or trackback from your own site. Long live the larb! This recipe was easy and delicious!